We sell Nature's Greatest Secrets products like Nature's Greatest Secret 10 ppm Colloidal Silver Liquid - 300ml online in the UK and directly from our award-winning store in Scotland. 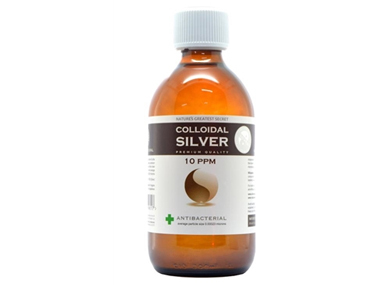 If you want to automatically receive an email when '10 ppm Colloidal Silver 300ml' is back in stock, just leave your email address below. Naturally Antiviral, Antibacterial and Anti-fungal. This colloidal Silver is crystal clear. This Colloidal Silver has a neutral pH level of 7.5. Supplied in amber glass bottle. Crystal clear Colloidal Silver is a sign of quality and shows the high ionic content of this solution. This Colloidal Silver has a neutral pH level of 7.5. Supplied in amber glass bottle. We sell real Nature's Greatest Secrets and other Colloidal Silver directly from our shop in Scotland and online throughout the UK. View more products from Nature's Greatest Secrets. Where can you buy real 10 ppm Colloidal Silver 300ml safely online? If you are wondering where you can buy Nature's Greatest Secret 10 ppm Colloidal Silver Liquid - 300ml safely online in the UK, then shop with us. We are an actual health foods shop; with real people selling real foods and products. Our award-winning independent shop is located in Stirling, Scotland since 1976. You can buy our Colloidal Silver in store or safely place an order with us online or over the phone. 10 ppm Colloidal Silver 300ml - Nature's Greatest Secret 10 ppm Colloidal Silver Liquid - 300ml in Colloidal Silver and Herbal Remedies, Tinctures & Supplements.